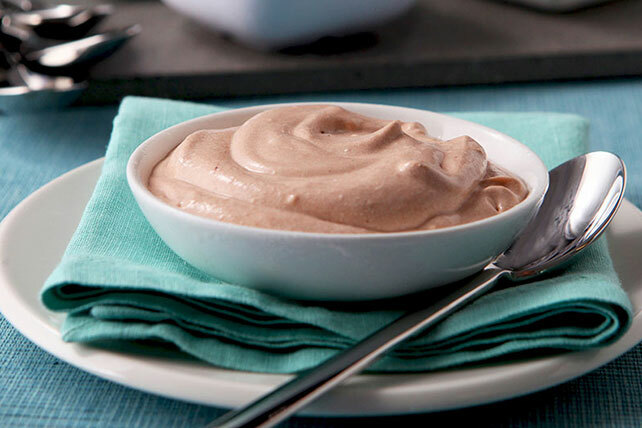 Vanilla pudding is flavored with instant coffee and whipped topping, then frozen into a creamy dessert designed for coffee lovers. Pour milk into large bowl. Add dry pudding mix and flavored instant coffee. Beat with wire whisk 2 min. Add whipped topping; stir until well blended. Cover. Freeze 6 hours or until firm. Store leftovers in freezer. Prepare as directed, gently stirring in 1 cup chopped OREO Cookies, chopped chocolate candy bars or chopped chocolate-covered toffee bars along with the whipped topping. Prepare as directed, using fat-free milk, JELL-O Vanilla Flavor Sugar Free Fat Free Instant Pudding, MAXWELL HOUSE INTERNATIONAL Sugar Free French Vanilla Café and COOL WHIP FREE Whipped Topping.